MJEAL Volume 1, Issue 1 Party! printer and should be going out to the world shortly. To celebrate, we’re going to have a little shindig. More formally, we’d like to invite you to our Volume 1, Issue 1 Launch Party! The event will be held Wednesday April 4 at 7pm at the Arbor Brewing Company (click here for a printable invitation). It should be a great time to play a little shuffleboard and indulge in self-congratulation over what we’ve accomplished together. 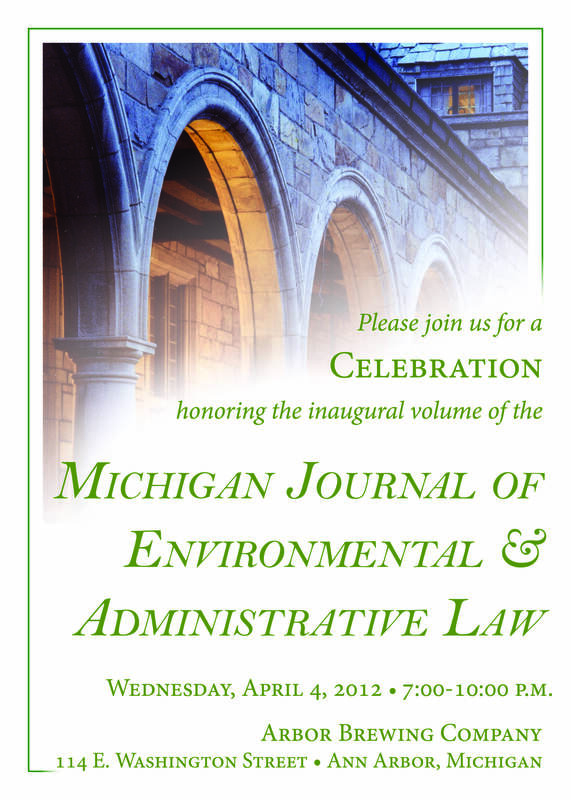 Prev The Michigan Journal of Environmental and Administrative Law is proud to announce the contents of its first Volume, to be released in April, 2012. Next Welcome to MJEAL’s Online Content!